WARWICK, RI — Rhode Island’s Congressional delegation announced the Warwick Fire Department will receive a $633,789 grant for a new rescue truck, part of $1,113,758 in federal funding awarded to the city, Little Compton, North Kingstown, and Woonsocket. On Thursday, U.S. Senators Jack Reed and Sheldon Whitehouse and Congressmen Jim Langevin and David Cicilline announced the grants for Warwick’s new truck and to help North Kingstown, Little Compton, and Woonsocket fire departments upgrade essential equipment. The federal funds were awarded through the Federal Emergency Management Agency’s (FEMA) Assistance to Firefighters Grant (AFG) Program, according to an announcement from Sen. Jack Reed’s office. AFG grants are designed to supply critically needed equipment, protective gear, emergency vehicles, training, and other resources necessary to protect local communities. Rhode Island’s Congressional delegation helped include a total of $350 million for AFG firefighter equipment grants in the 2018 Omnibus Appropriations law. The WFD will purchase a new, tandem-axle heavy duty rescue vehicle that will replace a dated, 26-year-old medium duty model that responded to over 1,600 incidents in 2016 alone. The new heavy duty vehicle will help firefighters with extrications, large vehicle stabilization, Advanced Life Support (ALS) medical response, surface and shoreline water rescue, rope rescue, confined space rescue, trench rescue and structural firefighting. The North Kingstown Fire Department will use its $268,605 grant to replace its outdated Self-Contained Breathing Apparatus (SCBA) currently in use by firefighters. The purchase includes new SCBA units, SCBA bottles, and face pieces. The equipment will be used by firefighters during emergency response situations to ensure safe breathing amid fires and other situations involving toxic air quality. The Little Compton Fire Department is receiving a regional $211,364 grant alongside the Woonsocket Fire Department to purchase new power cots, which are battery operated stretchers capable of lifting very heavy patients, incorporated with a hydraulic lift system that loads/unloads the power cot from the ambulance. The goal of the purchase is to reduce injuries to the department’s firefighter/EMTs, increase the safety of patients by decreasing cot drop incidents, and enhance the department’s operability throughout the region. “Our emergency responders deserve access to the best equipment possible so they can do their jobs safely and effectively. This funding will not only benefit our firefighters, but all Rhode Islanders,” said Cicilline. WEST WARWICK — Congressman Jim Langevin (D-RI), hosted a military medals presentation and veterans town hall meeting at VFW Post 449 in West Warwick Tuesday at noon, honoring seven veterans with medals for their service decades after the conflicts they helped fight ended, including Paul DePetrillo of Warwick, a U.S. Army veteran of the Korean War. Langevin presented DePetrillo, 69, a Specialist Fourth Grade in the U.S. Army, Korean Defense, with five medals: Army Achievement Medal with Bronze Star Attachment; National Defense Service Medal; Armed Forces Expeditionary Medal; Expert Badge and Rifle Bar and Korea Defense Service Medal. The event is the first of several visits focused on military and veterans issues that Langevin is holding on Aug. 28 and Aug. 30 as part of the Langevin Listening Tour, an initiative Langevin has led through the August congressional district work period to collect feedback and gain insight from constituents. “Rhode Island has a proud history of producing heroes,” said Kasin J. Yarn, the Director of Veteran’s Affairs for the State of Rhode Island. “Tomorrow’s ceremony is just another illustration of that. 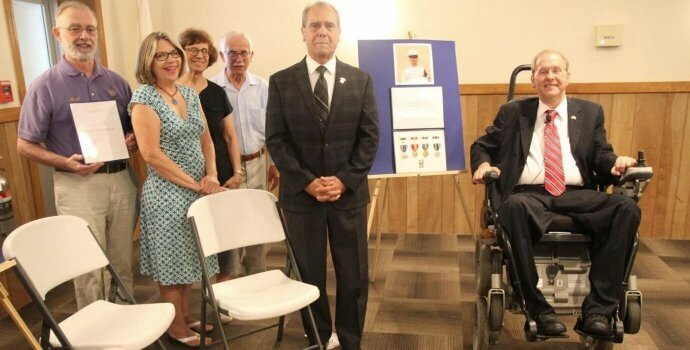 I applaud Congressman Langevin’s efforts to ensure these warriors and their families get the recognition they’ve earned and so thoroughly deserve,” Yarn said. Three House democrats introduced a bill Aug. 24 that would prevent President Donald Trump from revoking security clearances for political purposes. “President Trump has shown an alarming tendency to attack members of our intelligence and law enforcement communities when he believes it will be to his political benefit. His recent decision and subsequent threats to revoke the clearances of current and former national security officials is an unconscionable abuse of power, and it underscores the need to protect this process from further political influence,” said bill cosponsor Rep. Jim Langevin, D-R.I.
Trump drew the censure of many members of the intelligence community and Congress after revoking the security clearance of ex-CIA Director John Brennan, a vocal critic of the president, Aug. 15. “Trump’s revocation of John Brennan’s security clearance is petty and vindictive. The president has made a sport of using his broad authority to help his friends and attack his perceived enemies. That’s why safeguarding our security clearance process is critical — we have to prevent these kinds of abuses and provide proper recourse for those impacted,” said cosponsor Rep. Ted Lieu, D-Calif.
Trump also indicated that he was considering revoking the clearances of other frequent critics, including former FBI Director James Comey, former Director of National Intelligence James Clapper, former CIA Director Michael Hayden, former national security advisor Susan Rice and former deputy FBI Director Andrew McCabe. “President Trump has set a dangerous precedent by revoking or threatening to revoke the security clearances of current and former law enforcement and intelligence officials to punish his critics. For those who depend on a security clearance for their livelihood, this effort to create and impose potentially career ending consequences on individuals who appear on the president’s enemies list is unlawful and un-American,” said cosponsor Rep. Adam Schiff, D-Ca. The text of the bill resembles an amendment to the fiscal year 2019 defense appropriations bill offered by Sens. Mark Warner, D-Va., and Jeff Flake, R-Ariz., earlier that week. NEWPORT, R.I. — The Fire Department will receive $24,500 for equipment, supplies and training for the catamaran fireboat it acquired in April with an earlier port security grant, according to a press release issued on Tuesday afternoon by U.S. Sens. Jack Reed and Sheldon Whitehouse, and U.S. Reps. David Cicilline and Jim Langevin. Also announced was a $284,625 grant for the Bristol Fire Department to purchase a similar boat. The funds were distributed from the Port Security Grant Program, which is overseen by the U.S. Department of Homeland Security’s Federal Emergency Management Agency. Newport’s boat is named after former Fire Chief William H. Connerton Jr. Since 2014, fire departments and other entities in Rhode Island have received nearly $1.75 million in Port Security grants. EAST PROVIDENCE, R.I. (WPRI) — The Cumberland, Saylesville, Smithfield, West Warwick, and Woonsocket Fire Departments will be the beneficiaries of a $3.8 million federal grant, Rhode Island’s Congressional delegation announced Friday. The grant is funded through the Federal Emergency Management Agency’s (FEMA) SAFER Grant and the Assistance to Firefighters Grant (AFG) programs. The grant will go toward the hiring of 28 new firefighters and safety equipment among the five fire departments. “Making sure our fire departments are equipped with enough personnel and the proper equipment is vital to the protection of our communities,” Congressman Jim Langevin added. Since 2001, more than $38 million in AFG grants have been awarded to Rhode Island fire departments and nearly $43 million in SAFER grants since 2005, according to the delegation. The biggest problems in federal cybersecurity start at the top and fixes need to come from the top too, Rep. Jim Langevin, D-R.I., told Nextgov’s Critical Update podcast. When Defense Secretary Ash Carter made cybersecurity a top Pentagon priority during the Obama administration, for example, Carter’s subordinates showed the same passion for the issue, said Langevin, who co-founded the Congressional Cybersecurity Caucus. “You had everyone, all hands on deck, doing more to step up our cybersecurity at the Pentagon,” he said. By 2018, among other cyber initiatives, the Defense Department had launched five bug bounty contests, which loose troves of ethical hackers to search for vulnerabilities in Pentagon computer systems. When National Security Adviser John Bolton eliminated the position of White House cybersecurity coordinator in May, by contrast, it marked “an enormous step backward” for federal cyber efforts, Langevin said. Among other things, the lack of a White House point person on cybersecurity prevents the administration from speaking with a clear and singular voice about issues such as Russian election meddling and foreign efforts to penetrate U.S. critical infrastructure, said Langevin, who has co-sponsored legislation to restore and elevate the cyber coordinator position. “I’m very concerned about having a lack of coordination and oversight from the top,” he said. Langevin has criticized President Donald Trump for failing to consistently acknowledge Russian government efforts to undermine the 2016 election and for acceding to the elimination of the cyber coordinator position, but he has also praised some Trump administration moves, such as appointing highly qualified Homeland Security cyber officials and continuing Obama-era cyber policies. Going forward, Langevin said, he holds out hope the president will make cybersecurity a priority and urge his cabinet secretaries to do the same. “The president would serve the government well by having his cabinet secretaries around the table and … asking what they’re doing to step up their game in preventing cyber vulnerabilities,” he said. You can listen to the full episode [here] and subscribe through the Apple store or Google Play. 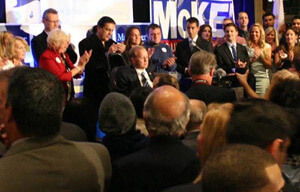 WESTERLY, R.I. — Gov. Gina Raimondo, U.S. Sen. Jack Reed, U.S. Rep. Jim Langevin, and Rhode Island Department of Transportation Director Peter Alviti, Jr. joined the Artists’ Cooperative Gallery of Westerly to celebrate the reopening of the Westerly Train Station Friday. Following Amtrak’s change to online and mobile smartphone ticketing, the station was closed for the last two years. The new station features an indoor waiting area, access to restrooms while providing a new arts venue for the local Westerly community. The station will be closed Sunday to Tuesday but will open Wednesday through Saturday 11 a.m. to 7 p.m. and Saturday 1 p.m. to 5 p.m.
“This project is a fantastic example of what can be accomplished through successful partnerships. The state, local community and the Artists’ Cooperative worked together on a solution that will provide a vital service to the public while expanding the cultural fabric of the community,” Raimondo said. “It is great to see this historic train station being reopened to welcome travelers and art lovers alike. Instead of just a platform for passengers, it will serve as a platform for talented local artists to showcase their work in this unique setting,” said U.S. Senator Jack Reed. Senator Reed is the Ranking Member of the Appropriations Subcommittee on Transportation, Housing and Urban Development , who worked to provide record funding for Amtrak in 2018, some of which will help Westerly Train Station make needed improvements to comply with the Americans with Disabilities Act. “This creative approach for reopening the Westerly Train Station provides a temporary home for the Artists’ Cooperative of Westerly, ensuring the public retains access to the works of local artists. I applaud the Gallery and RIDOT for working together to support Rhode Island’s art economy,” Langevin said. The gallery is expected to remain in the station until renovations are completed on its former location, the United Theatre complex. The complex will be home to the gallery and will be the first satellite location of the Rhode Island Philharmonic Music School when the renovations are finished. The Westerly station, owned by RIDOT, has served passengers since 1912 and provides service for Amtrak’s Northeast Regional trains, including nine stops on weekdays and six stops on weekends. Editor’s note: these are the candidate’s responses to questions provided by RIPR. The views expressed are the candidate’s alone, edited only in cases of inappropriate or libelous language. No changes have been made to correct errors of fact, spelling or grammar. What are your positions on immigration reform? We need comprehensive immigration reform in this country. That means improving security at our border, but it also means reforming and modernizing our visa system. We also need to address the undocumented members of our communities, particularly the Dreamers brought to this country through no fault of their own. Unfortunately, far from working toward comprehensive reform, the current Administration has embraced senseless – and at times heartless – policies including a border wall, a travel ban targeted at Muslims, and, most disturbingly, the separation of children from their families at the border. Should the Affordable Care Act be repealed and replaced? If so, by what? Americans need affordable, quality health care. The Affordable Care Act was not a perfect law, but it was a significant step toward expanding coverage for millions of Americans, including 100,000 Rhode Islanders. However, many Rhode Islanders are seeing steep premium increases due to the Trump Administration’s efforts to undermine the law. That’s why I introduced the Individual Health Insurance Marketplace Improvement Act, a bill that would create a stabilization fund to increase competition among insurers and lower premiums. I hope to see more work on a bipartisan basis to advance solutions rather than overturn meaningful reforms, like protections for people with preexisting conditions, that have changed the lives of so many for the better. Rhode Island was rated by CNBC as having among the worst infrastructure in the nation; Should transportation infrastructure be a more important issue in the US House’s next legislative session? Rhode Island’s infrastructure is in desperate need of repair and modernization – especially our highway bridges, which are beaten down from extended use and corroded by storms. I am pleased the state is making this a priority, but we also need the federal government to pitch in more. That’s why I introduced the SAFE Bridges Act, which would direct up to $170 million in federal funds toward repairing Rhode Island’s bridges. I will continue to fight for funding that will enable our state to build the first-rate roads, bridges and public transit systems we need to support a 21st Century economy and allow Rhode Islanders to connect and travel safely and with ease. How can Congress help solve the opioid crisis? We must take a comprehensive approach to the opioid epidemic, including educating physicians about opioid prescribing practices, funding research that looks at alternative pathways and treatments to manage pain, and supporting programs that are the lifeline for those seeking treatment and recovery from addiction. It’s also important to prevent these substances from arriving in our communities in the first place. That’s why I’m pleased that my bill, the Joint Task Force to Combat Opioid Trafficking Act, passed the House of Representatives. The legislation creates a task force at the Department of Homeland Security to increase coordination within the Department and with public and private sector partners in order to stop the inflow of opioids before they cross our border. This public health emergency cannot be ignored, and Congress’ work is important to reducing the prevalence of addiction and overdose deaths in our communities. What is your position on abortion and Roe v. Wade? My pro-life stance is shaped by my personal experience of having come so close to losing my own life. However, I did not come to Congress to overturn Roe v Wade, and in this time of deep political divisiveness, any court ruling changing that precedent could tear deeply at the fabric of our nation. I believe we should work together to reduce unintended pregnancies by expanding access to reproductive health care, contraception, scientifically-based sexual education, and support services for new mothers. Is flying unmanned drones in foreign airspace an acceptable method of eliminating terrorists? I am honored to serve on the House Armed Services Committee, which oversees military drone programs. While unmanned aerial vehicles provide the United States with a great number of strategic advantages, we must ensure we use them responsibly and humanely. When drone strikes are carried out in accordance with US and international law, they can be an effective tool for combating terrorist groups like ISIL and stopping their deadly activities before they inflict more damage at home and abroad. Should the US pull out of the Iran deal? I was deeply disappointed that the President chose to unilaterally withdraw from the Iran nuclear deal. The agreement provided for comprehensive monitoring by the international community, and there remains no evidence that Iran violated its commitments. Walking away from the deal abandons our allies, weakens our credibility, harms our ability to foster similar diplomatic agreements in the future, and undermines the central goal of the agreement – to prevent Iran from obtaining a nuclear weapon. Withdrawing from this agreement threatens U.S. national security and international stability, and I believe the President should reverse his decision. Should the US continue to give financial aid to Israel? Israel is one of our closest allies and exists in a perilous region of the world. It is imperative that we continue to support its security and economy as a bastion of democracy in the Middle East. I have visited Israel several times, and I know that many Rhode Islanders also have close ties. I will continue to support efforts in Congress to strengthen these bonds, including my bill to enhance cooperative cybersecurity research and development. JOHNSTON, R.I. — Citizens Bank’s new, 425,000-square foot, $285-million campus here means a lot of things to a lot of people: jobs coming to town, a 20-year property-tax deal, walking trails open for public use where a landfill used to sit, two years of construction work, a chance for politicians to wield scissors at a ribbon-cutting ceremony Tuesday. But to Anna Costa, a longtime Citizens employee who came to the event in a bedazzled green hat and green beads, it’s much more than even all that. Costa was one of the hundreds of Citizens Bank employees who came out, clad in green, to watch the ceremonial opening of the new corporate campus. Company officials and local dignitaries said the new campus would be a boost for the town and the Rhode Island-based bank. “This was going to be the largest construction project in Rhode Island in over a decade, so there was a lot at stake here, making sure we got this right,” CEO Bruce Van Saun told a group of employees and visitors. The project, built on an old landfill off Route 295, took two years almost to the day from the groundbreaking to the ribbon-cutting, and very nearly was finished on budget, Van Saun said. Within months, some 3,000 people will be working in Johnston, moving from other parts of the company, according to bank officials. Citizens’ headquarters will remain in Providence. Of the new people who will be working in Johnston, about 800 will be call center employees moving in from space the company is currently renting. The design goes against the stereotypical image of a corporate call center: the windowless warren of cubicles, dimly lighted in fluorescence. No matter where anyone sits, said Keith Kelly, president of Citizens Bank Rhode Island, they won’t be more than 40 feet from a window. “Creating a state-of-the-art facility like this will help perform and collaborate better,” Kelly said in an interview Monday. The campus also features ball fields that local youth leagues will be able to play on, space to play bocce — Costa said she was going to challenge the mayor to a game — and a rain-collection system on the roof. Any rain-collection system would have been put to use Tuesday: it rained on and off all morning, including a quick burst the exact moment that a group of politicians and bank officials snipped up portions of a Citizens Bank ribbon outside to applause. Patrolling it all was the Knightscope K5, a robotic security guard resembling a portlier R2D2. It is equipped with cameras and can read license plates to make sure people don’t come onto the campus that aren’t supposed to, said Derek Lemire, senior physical security officer. “It shows we’re forward-thinking,” Lemire said. For the ribbon-cutting ceremony Tuesday, Citizens pulled out all the stops: Groups of employees, whom the bank refers to as “colleagues,” waved and smiled to cars as they drove in. Local students marched and sang, and a local police honor guard took part. The entire congressional delegation — U.S. Sens. Jack Reed and Sheldon Whitehouse and U.S. Reps. Jim Langevin and David Cicilline — were there, as was Gov. Gina Raimondo. The dignitaries lauded, in particular, Johnston Mayor Joseph Polisena. Whitehouse referred to the site of the bank as the “wind-swept Mount Polisena.” Langevin noted that Polisena was always ready to talk turkey. Polisena, for his part, said the development will change the town for the better. “We all know they could have gone up the road to Taxachusetts — err, I mean, Massachusetts,” Polisena said to laughter. The town approved a tax deal under which Citizens will pay $250,000 per year in property taxes per year. Especially compared to a big development with lots of housing units and lots of students, it was a good deal for the town, Polisena said. NORTH KINGSTOWN, RI – U.S. Senator Jack Reed (D-RI) this week announced an $855,200 federal grant for the Quonset Development Corporation (QDC) to purchase new yard equipment that will assist the Port of Davisville with handling cargo and advancing a marine highway project. The grant comes after Reed successfully worked to designate short sea shipping between Rhode Island, Brooklyn, and Newark as a marine highway project in March. This new federal grant will provide the Port of Davisville with one reach stacker, four yard tractors, and four bomb carts, which will help to facilitate the movement of containers at the Port and provide added capability to make the Port’s short-sea shipping service more efficient and competitive while also providing a viable alternative for freight shipping. According to Reed, the grant will also provide resources to help market this new service. QDC Managing Director Steven King said the grant funding will accelerate the Port of Davisville by enabling the corporation to handle container shipping as “a means of moving goods” while expanding their capabilities in short-sea shipping. Marine highways are navigable waterways that offer an alternative to the nation’s crowded highways and roads for moving freight or passengers. Under the America’s Marine Highway program, the U.S. Department of Transportation’s (DOT) Maritime Administration (MARAD) periodically designates additional marine highway projects, offering new or expanded short sea shipping services and routes that have the potential to provide public benefits and long-term sustainability. Being recognized by MARAD, the marine highway project will also receive preferential treatment for future federal grants and other assistance from DOT and MARAD. The Port of Davisville, Brooklyn and Newark service is a proposed container-on-barge service that will be operated by SEACOR AMH, LLC and will include a dedicated run twice per week with up to 800 TEU containers. This service will operate in the Block Island Sound, Narragansett Bay, Long Island Sound, and East River. Last March, Reed announced the project in Rhode Island alongside MARAD Administrator Rear Admiral Mark H. Buzby, marine workers, and business leaders during a tour and visit to discuss federal funding for small shipyards and new opportunities for Rhode Island businesses. At that time, Reed also asked the rest of the Rhode Island Congressional Delegation to join his letter to Administrator Buzby in support of QDC’s request for the funds. The letter was signed by Reed, U.S. Senator Sheldon Whitehouse, and U.S. Representatives David Cicilline and James Langevin.